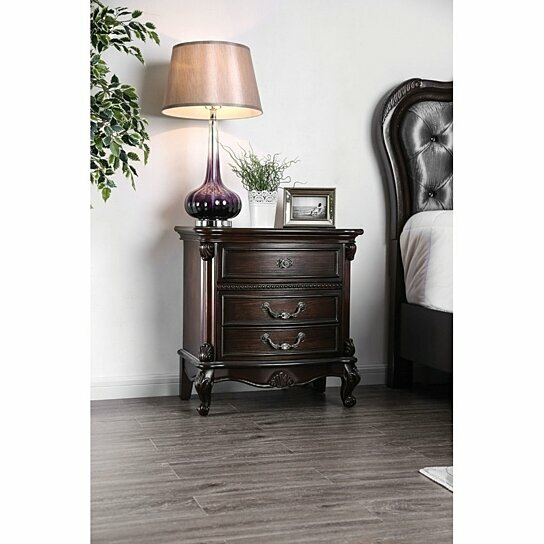 Traditional in style, this night stand will help in transforming your bedroom into a high class space. Solid wood and wood veneer construction provides a durable assistance to this night stand. The three spacious drawers offers a great storage to all your bedtime essentials that you would like to keep close by your reach. Accented with natural wooden texture, aesthetic carvings and scrolled legs support, this night stand will surely makes an imposing impact. One night stand with three drawers only. Made up of sturdy solid woods and wood veneer that provide long usage. Supported by scrolled legs and feature antique metal pulls.